Camp Zambezi is a true bush camp – no electricity, no permanent structures, no plumbing – a taste of the way safaris used to be. The camp is designed to be erected or dismantled within hours, leaving no trace of its existence on the environment. The camp has comfortable beds furnished with linen and duvets. The large tents have en suite toilet facilities for night-use. A long drop toilet and showers (with plenty of hot water) are also provided for day-use. Our staff service your tents daily and laundry can be done on site. All water used in camp has been filtered and bottled water is also available. Each morning, staff will fill the wash basin outside your tent with hot water for washing or shaving. Lighting is by hurricane lamp but guests should bring their own torch or headlight. Games drives are in open 4×4 Toyota Land Cruisers. These drives may take you away from the river, to investigate the diverse inland habitats and occupants that make up the ecology of the area. 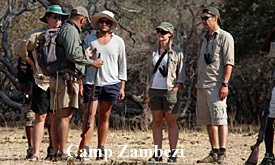 Walking to explore and learn about the area, with your professional guide it is the best way to experience Mana Pools. The guide carries a weapon at all times. Mana can provide some amazing experiences, if guests are looking for close encounters with game. It is famous for its bull elephants and an encounter one of these gentle giants is an experience never to forget! Canoeing is a wonderful way to take in the bush – gliding silently past herds of animals often unaware of your presence. Canoeing is done in 5.5m (18ft) Canadian style canoes, fitted with comfortable seats and cushions. Fishing is also a popular activity from Camp Zambezi, particularly towards the end of the dry season – Sept/Oct, when the tiger fish are biting. 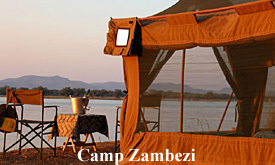 Camp Zambezi is the perfect launch point each day for fishing enthusiasts. Fly by air-charter into Mana Pools National Park where you will be met by your guide with ice cold drinks. You will then embark on a half hour drive through jesse bush and mopane scrub to Camp Zambezi arriving in time for lunch. You may, by then, already have met a few of your new neighbours – elephant, kudu, zebra, impala and many birds! A mobile tented camp will have been set up by the camp staff – walk-in mosquitoproofed tents with en-suite chemical toilet, external long-drop toilets, hot showers and a dining area next to the fire where iced drinks and sumptuous bush-prepared meals will be served. Our chef will have prepared a delicious lunch to give you strength for the first afternoon’s walk – a familiarisation walk to see the lay of the land. Then back to camp for sundowners, a hot (or cold if you prefer) shower, and a fine dinner. Although tempting to stay awake to listen to the neighbours going about their nightly activities, but the beds are very comfortable and warm so it may be difficult to stay awake! To make the most of your day we suggest an early morning wake up, the hand basins outside each tent are filled with hot water before first light to allow you to shave or freshen up. Go straight out to check for spoor and animal activity around camp. Enjoy a beautiful sunrise and, on your return to camp, a light breakfast will be served with tea and freshly brewed coffee. After breakfast, set off on your morning’s activity, you may take to the river for the day (or morning), go by vehicle or on foot to explore the National Park. Whether you opt for land or water activities, half or full day, you can be assured of incredible experiences. The guide will carry a weapon, a first aid kit, a packed lunch and extra water. Clients may carry extra personal water and personal items for the day. Finally, back to camp for the night where a wonderful meal, hot shower, cold drinks and friendly staff are awaiting. Another day along the lines of day two – the choices are yours to make the most of this amazing spot. 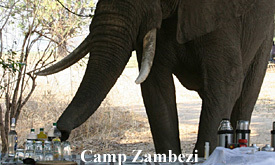 This third night will again be spent at Camp Zambezi – with all the trimmings. Depending upon the guests time of departure, or if guests are moving on to a canoe trail or alternative camp, they may either take another early walk before breakfast or have a bit of a sleep in! After that, there will be a short game drive to the airstrip or Nyamepi, Mana Main Camp, where we bid you farewell!